First off let me say that this is some heady koolaid. It’s like Koolaid seriously spiked with Russian Vodka. I could say that it’s not for the faint of heart and that wouldn’t be inaccurate, but it’s also not hard to play or to gm. It’s really more like a puzzle box that the basics of operating are very straightforward and easy to work with, but leaning all its nuances and subtleties is going to require some time and effort. If the first time player to Hero is in the hands of a gm who knows what they’re doing playing a character is amazingly simple. The basic die mechanic is about as easy as it gets. Roll 3d6 do some quick math and boom success or failure. Here’s the rub to that, it’s that quick math that can become incomprehensible if the gm isn’t on the ball because there are a huge number of things that can come into play and someone has to juggle them all at some point. Now, it should be noted that many of the rules can be treated as “optional” and simply glossed over. Hit location is a good example. If you don’t want to use hit location don’t use hit location, it’s easy enough to just ignore it and assume that all hits are generically to the torso. I will say that the game becomes more interesting as you add in the more involved rules. Probably the hardest part of the Hero system for the player is actually going to be character generation. For those who play the game at a convention that problem is removed because the gm will create the characters for their game. Which leads me to a serious recommendation for players. Write up your character concept in plain English (or whatever you speak) and let the gm work out the details. Certainly for the first few characters this is a very good idea and I would never try to create a character without gm involvement. So much of what comes up in the game is a result of what the gm has done to cook their game that it’s almost impossible to reliably create a character without gm involvement. 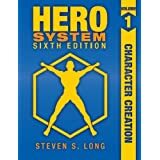 With the enormous wealth of information available for the Hero System 6th Edition it might seem at first look that running a Hero game would be very complicated for the gm. Steven Long and his merry minions at Hero Games have done a spectacular job of creating a very playable game with mechanics and concepts that just work. That’s the thing about Hero, complex as it can be everything just works. This is largely because everything basically works the same way. Pretty much without exception you’re going to roll 3d6 do some math and get a result that will make sense. Die rolls are made at sane times and nothing seems to take very long to resolve. I’ve never had to make more than a couple of die rolls or look in more than one place for an answer. Hero Games provides a wealth of available resources and information from free pdf documents to a very active and vibrant community that is both helpful and knowledgeable makes the learning of the game a much less imposing task. Without exception the most difficult part of the game system for the gm is game preparation. But even that doesn’t have to be an onerous undertaking. As complex and rich and full as Hero is, there is so much that’s already done that a full game can easily be done without having to make anything yourself. The time and effort investment comes in when you start building custom elements for the game. Let me add at this point that creating custom elements for the game is where the real fun of game preparation can be found. There is something imminently satisfying about custom making powers, effects and anything else for games. Hero provides the ability to create anything for the game. The price for that power is that it’s not necessarily easy or quick to make. I’ve spent two sections of this article talking about how great Hero is, and that’s not about to change. I am going to talk about a couple of things about Hero that are somewhat barrier imposing on players and gm’s wanting to get started with the game. The two things that I think make Hero somewhat difficult to get started with are the absolute wealth of material available. Very productive, Hero Games is constantly putting out new material and updating material for their game. This is great in that there’s a lot to work with and I’m not for one second suggesting that they change. Having so much material makes figuring out where to start (particularly without someone to show the way) a heady task. I’ve spoken with other gm’s’ and players and the most common question I hear (I asked it myself) is what do I need to buy? There’s not a clear cut answer to that question but with some help from wizer heads than mine I have a solution to that problem. Start with the Hero Basic Rules book either on pdf or in hard copy. I like books but the pdf has all the information you really need to get started. From there it’s a pretty easy jump to the other resources available. The second obstacle is actually in my mind a little more limiting for new players. The numerous and wonderful books that Hero Games provides are not cheesy little digest books poorly put together and poorly laid out. They are heavy weight well bound books that are well thought out, well designed and put together. As such they are not cheap. The character book reminds one of a college textbook for it’s size and mass and tips the cash register at $39.99 retail. Start to build up a collection at all and it represents a fair cash investment. That said, they are worth every penny. You may remember that I singled out the hit location rule as one that could be used after getting a little used to the combat system. I have found, what to me is, an easy way to resolve the hit location rule. Allow me to explain. Hit location works thusly; (On a successful attack) Determine the hit location by rolling 3d6 and consulting the hit location table. (It’s located on p. 109 of the Combat and Adventuring Guid) then determine damage as normal. What I’ve taken to doing is instead of rolling 3d6 and then rolling again, I roll 6d6 in two different color bundles one is for the attack and one is for the hit location determination. Another tip I might suggest is for Knockback. Knockback can occur because of a number of circumstances but most often occurs in super hero based games. Only attacks that do physical damage (should) do knockback but I can think of and have seen cases where it made sense. In essence mental attacks probably don’t do knockback. Knockback is a function of how much body damage is done by the attack. Again having multiple colors of dice can make this easier to keep track of. Major recommendation. Buy lots of d6’s in lots of different colors. Great read. I love the Hero System! I’ve been away from gaming for a very long time and this post totally has me wanting to run out and buy the 6th edition. I’m glad you enjoyed it. Hero is a great system and I’m really enjoying learning it. I hope that you will find some friends and start gaming again. So, they killed all email that wasn’t ship’s email. I really, really, desperately hope this thing autoupdates you whenever someone comments, because otherwise you’ll have to wait until we pull in to Yoko sometime later this summer/early fall.